The Republican-controlled House pushed ahead Thursday with a bill that would raise taxes on people earning over $1 million a year as hopes faded for a pre-Christmas deal between President Barack Obama and Speaker John Boehner to avert the so-called fiscal cliff. Senate Majority Leader Harry Reid, D-Nev., said lawmakers would return to the Capitol on the Thursday after the holiday as a grand bargain to avoid the automatic tax hikes and spending cuts proved elusive. Across the Capitol, House Majority Leader Eric Cantor, R-Va., said the GOP has the votes for a bill, dubbed “Plan B” by Boehner, aimed at upping the year-end pressure on Capitol Hill Democrats and Obama. “We, as Republicans, have taken concrete actions to avoid the fiscal cliff,” Cantor insisted at a news conference. He expressed confidence the GOP leadership will have enough votes to pass the bill. But the legislation looked to be a dead letter in the Senate and earned a White House veto threat. The possibility of a ruined holiday and the absence of a deal left hard feelings all around. Senate Republican leader Mitch McConnell blamed the president and Democrats. “They’ve been playing Lucy and the football with the American people for months,” said the Kentucky lawmaker. “They’ve said no to every single proposal that’s been offered to avoid this tax hike — including their own. They’re running out the clock. Moving the goal posts. Sitting on their hands. They aren’t doing anything. “Well, I say, ‘Enough.’ Enough. The time for games is over,” he said in remarks on the Senate floor. On Wednesday, a confident Obama dismissed the GOP bill, telling reporters that he and Boehner were just a few hundred billion dollars apart on a 10-year, $2 trillion-plus deficit-cutting pact. Republicans should “peel off the partisan war paint” and take the deal he’s offering, Obama said sharply at the White House. He noted that he had won re-election with a call for higher taxes on the wealthy, then added pointedly that the nation aches for conciliation, not a contest of ideologies, after last week’s mass murder at a Connecticut elementary school. Obama continued to press for a comprehensive budget pact with Boehner to replace an economy-jarring set of automatic tax hikes and sweeping spending cuts to the Pentagon and domestic agencies set to take effect in January. Boehner countered that the president will bear responsibility for “the largest tax increase in history” if he makes good on his veto threat. But to a remarkable extent, the two sides have flip-flopped. Republicans have for years argued that voting to renew most Bush-era tax cuts on income, investments and elsewhere, but allowing upper-end tax cuts to expire would be a debilitating blow to the economy and small businesses. Now, they point to the 99-plus percent of taxpayers who wouldn’t be affected by their latest plan. For their part, Democrats who supported the million-dollar threshold not too long ago — including such lawmakers as Sen. Charles Schumer, D-N.Y. — have lashed themselves to Obama, who carries great leverage into the battle over the fiscal cliff, the price to pay for Washington’s chronic inability to address the deficit. Boehner expressed confidence the Republicans’ narrow, so-called Plan B bill would pass the House on Thursday despite opposition from some conservative, anti-tax dissidents. The leadership worked to shore up the measure’s chances late in the day by setting a vote on a companion bill to replace across-the-board cuts in the Pentagon and some domestic programs with targeted reductions elsewhere in the budget, an attempt to satisfy defense-minded lawmakers. That measure, which passed the House in May only to be ignored by the Senate, would cut food stamps, benefits for federal workers and social services programs like day care for children and Meals on Wheels for the elderly. It would spare the military from a $55 billion, 9 percent automatic budget cut next year that is punishment for the failure of last year’s deficit-reduction “supercommittee” to strike a deal. It also would protect domestic agencies from an 8 percent cut to their day-to-day operating budgets next year, but would leave in place a 2 percent cut to Medicare providers. With Christmas approaching, Republicans also said they were hopeful the tax measure could quickly form the basis for a final bipartisan “fiscal cliff” compromise once it arrives in the Senate. Democrats, in the majority in the Senate, gave no indication of their plans. Boehner won a letter of cramped support from anti-tax activist Grover Norquist during the day. Norquist’s organization, Americans For Tax Reform, issued a statement saying it will not consider a vote for the bill a violation of a no-tax-increase pledge that many Republicans have signed. But another conservative group came to an opposing conclusion. “Allowing a tax increase to hit a certain segment of Americans and small businesses is not a solution; it is a political ploy,” the Heritage Foundation said in a statement. That appeared to be the hope of Boehner and the rest of the leadership — that by showing his rank and file is united behind the fallback bill, the speaker would be in a strong position to demand concessions from the White House in the broader endgame. But Boehner did not slam the door on further compromises in his brief appearance before reporters. “Republicans continue to work toward avoiding the fiscal cliff,” he said. In talks to date, Obama is now seeking $1.2 trillion in higher tax revenue, down from the $1.6 trillion he initially sought. He also has softened his demand for higher tax rates on household incomes so they would apply to incomes over $400,000 instead of the $250,000 he cited during his successful campaign for a new term. He also has offered more than $800 billion in spending cuts over a decade, half of it from Medicare and Medicaid, $200 million from farm and other benefit programs, $100 billion from defense and $100 billion from a broad swath of government accounts ranging from parks to transportation to education. In a key concession to Republicans, the president also has agreed to slow the rise in cost-of-living increases in Social Security and other benefit programs, at a savings estimated at about $130 billion over a decade. By contrast, Boehner’s most recent offer allowed for $1 trillion in higher taxes over a decade, with higher rates for annual incomes over $1 million. 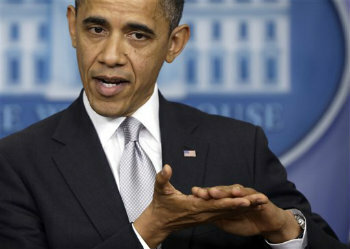 His latest offer seeks about $1 trillion in spending cuts.